Ultra Electromagnetic: Lifter for Lifting Angles is used read more..
We are successfully meeting the requirements of our clients by offering the best quality range of Circular Cast Housing Electromagnetic Lifter. 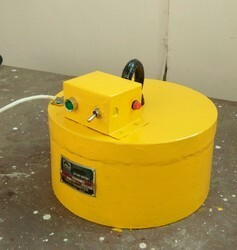 - Newly developed Battery operated magnetic lifter. - Light weight and robust construction. - Safety factor of 1:3 is maintained for each magnetic lifting capacity. - EPM Lifter-Battery power only needed to switch On and Off. - For loading/ unloading plates from railway wagons/ trucks. - For storing in plate yards. - 10 – 15 mt lift capacity. - For feeding plates onto a flame/ plasma cutting machine table, one at a time. We are successfully meeting the varied needs of our patrons by offering a wide gamut of Electromagnetic Lifter as per their precise needs. - Loading/unloading of steel scraps/pig irons/ cast iron boring/broken steel from trucks. - Handles slabs, blooms and ingots. 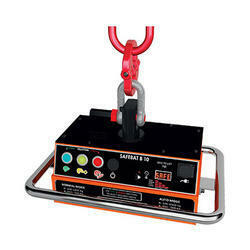 Usage: This type of lifter widely used for lifting round bar or pipe. As per the needs and requirements of our clients, we are involved in providing Electromagnetic Lifter. Usage/Application: for lifting the component. Size Capacity: 100 kg to 5 ton. applications in sheet metal industries. Rectangular Electro Magnet Lifter offered are made available by us in standard finish sizes and are capable of lifting both hot as well as cold billets. These are also suitable for use in steel plants over continuous casting skid banks and are highly demanded for use in lifting cranes.